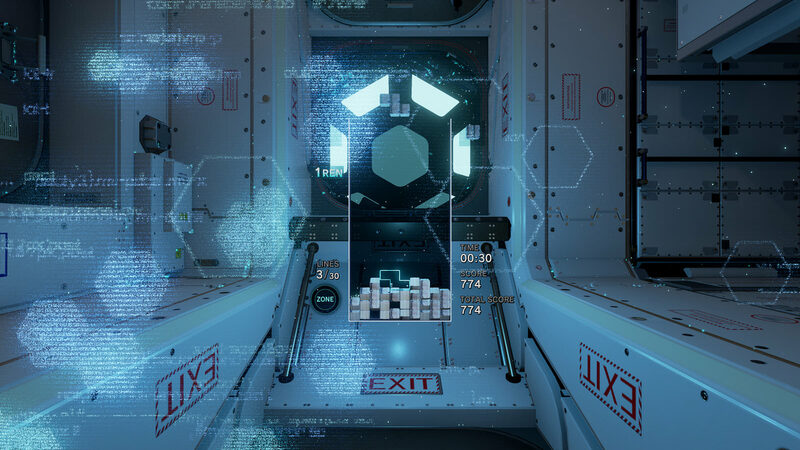 The thing I'm excited to test is the dizzy factor of VR mode as compared to First-Person Tetris. Not in a million years. Wtf were they thinking. Idiots. Henk Rogers wanted this. Yay. They have multiple definitions of what Tetris effect means and they are all wrong. Why does the tetris effect really happen? Because you HAVEN'T played it ENOUGH. Your brain tries to find solutions and then it goes away completely. Single preview: is this for just the first level, an option, etc. or is it a conscious game design choice? If it's single preview all the way through, props to the game designers. Responsiveness: pieces appear to come out as soon as you hard drop, with exception to line clear. Anybody got a read on autorepeat/DAS? Zone mode: need more info. The E3 interview and footage showed some more gameplay than the trailer (which btw has over one million views). It'll be the best looking (and sounding) Tetris game but I think it will also be rather casual. Multiplayer wasn't mentioned once and I doubt Tetris Effect will have it, although multiplayer is the thing which works best in the Tetris guideline ruleset. Looks like Tetris Effect will be centered around a Marathon-like mode, although Marathon is the most broken thing in the guideline. either scramble/stir up the playfield or add garbage lines from time to time in Marathon: you have to disturb the player somehow to make the game challenging in a good way. as said before, stacking for Tetrises with the well on the wall is just too easy otherwise; even with 1 preview I can still clear > 80% of the lines with T-Spin Triples until gravity becomes too high. either extend the lock delay when the piece spawns or add some spawn delay: in level 25 or so, lock delay is decreased to 0.3 seconds in which case the piece often locks before you can move or rotate it. my suggestion means additional time for the player to prepare for the piece, but no additional time once the first input is made. A spawn delay should be around 4 frames long (66 ms between locking of a piece and spawning of the next piece). An extended lock delay should be around 50 % longer than the usual lock delay but never longer than 0.5 seconds. make an option where you can change the randomizer: Bag randomizer isn't random enough. There are patterns where you can stack infinitely or where you can make lots of T-Spin Doubles or T-Spin Triples. I also think bag randomizer undermines 1 preview. I think the best way to implement a good really random randomizer is with the help of weights. For examples, see the functions nextolaf() and nextrecursive() in the following pastebin (Java code). make a mode for pros with this SRS-like rotation system and without move reset lock delay: SRS behaves awfully under high gravity. This rotation system deactivates the upward kicks (those will kick the pieces to unfamiliar columns and they can be abused to climb over a hill) and introduces a rotation which will still work when the piece touches the gound in spawning orientation. All the downward kicks which people know from multiplayer will still work. Instead of move reset, use step reset (lock delay is only reset when piece falls down a row) or entry reset (lock delay is only reset when piece spawns; in this case disabling the upwards kicks is sufficient). customizable controls: The default setup for consoles / handhelds is that you move and harddop with D-pad / arrow keys. However on PC, harddrop and sidewards movement are on different hands (harddrop = Space, sidewards movement = arrow keys). It's very hard to switch platforms without customizable controls. Regarding the Zone mechanic: I think it's a nice feature. It will bring a little more strategy in the game: Usually players just stay at the bottom, repeating their techniques. The feature will force you to upstack from time to time to optimize scores. Once you trigger the mechanic, all lines you clear will stay in the playfield but will be moved to the bottom (Tetris Monster also did this). When the zone interval ends, the game counts how many lines you 've cleared in total, and rewards points accordingly (and removes the lines). Not sure how T-Spins are handled int his case. I hope they are not completely worthless during this interval. The game uses a drop points multiplier. Usually, games don't use such a multiplier, so points from softdrop and harddrop become irrelevevant in Marathon. The drop points multiplier seems to be independent from the line clear points multiplier. When the zone interval is activated, drop points are doubled, and later even tripled (makes sense because the height is reduced the more lines you've cleared). Both multipliers can change during a level. A level usually lasts 24 or 30 lines. Once a level is finished, the score is reset to 0. 30 is a number we know from Endless Marathon (30 stages/levels whereas each stage takes longer than 10 lines here). Fan-favorite is a little overstatement. Those modes must be present in any official game. This one sounds interesting. When I heard player grading first, I thought it would be like in TGM3 where players have a life-time rank and the last few played games determine if your rank goes up or down. But can that even work, when there's a mode similar to Endless Marathon where each stage takes 20+ lines to clear? For a life-time rank games must be rather short. After thinking about it, I came to the conclusion it must mean a system where your score is just converted to a grade depending on which mode you play. I still hope that the game will use a life-time rank for each relevant mode. I don't like that games just acknowledge your highscores in singleplayer because you will barely ever beat your highscore after having played for some months and a highscore mustn't be representative for your average performance. I also hope there's a global leaderboard. Random note but I adored the music in it. But like I'm so happy a very casual one was released. So many fast paced ones and I've always wanted a happy zen tetris I can just zone out and just play without stressing out. And a talk with the developers. At 19:00 they explain the Zone mechanic and at 22:22 they talk about the Tetris guideline and whether they are allowed to break it under circumstances. It's interesting to see an expert classic Tetris player but I would have liked more to see an actual expert guideline player. Anyway, watching this video made me realize how fast paced Tetris Effect is for a singleplayer game. There's no delay between the placement of a piece and the spawning of the next piece (except if line clear) and auto repetition is pretty fast. I think it's 10 frames of DAS (Delayed AutoShift) and 3 frames of ARR (AutoRepeat Rate). edit: noticed that Mark MacDonald is also present in that video. That's the guy from the developer interviews (besides Tetsuya Mizuguchi). The line clear delay is 30 frames (0.5 seconds until ghost piece shows up, independent of how many lines were cleared), the visual effect lasts a little longer (could be distracting under high gravity). Also, the gravity counter is not reset after a line clear (probably not reset every time a new piece spawns): If let's say a piece falls down a row every 22 frames and the previous piece was hard dropped 16 frames after its last gravity step (16 frames after it fell down a row), then the next piece will make its first gravity step 6 frames after the end of line clear delay. Interesting observation regarding the gravity counter. Do any other popular Tetris game do that? Seems like a complete oversight. I agree with most of what you are writing, Okey_Dokey. Marathon has been a joke since Tetris Worlds, and making an entirely single player game based on all the rules guidelines have enforced over the past many years would just result in an insanely boring game. I get that they are going for making this a complete casual game (which could work, to be honest), but I also think that if surviving isn't going to take one ounce of skill, and time isn't a factor, there's no sense in playing single player modes at all. Bag randomizer has to go, and in my opinion, so does the hold button. Get back to the classic puzzle concept. Most of your ideas are good, and I really appreciate the compromise between guideline traditions and additions that would grease the game for single player challenges. I would love a serious alternative to TGM for modern single player Tetris. I can't answer the question whether other games do that, too. I just made that obversation because I wanted to see, if line clear delay was really 0.5 seconds. It's an oversight but it's unimportant for later levels. Can't say the same for some bugs in Tetris Ultimate. There's a disadvantageous bug in Tetris Ultimate that makes it skip line clear delay (covered by this great video) and there's an advantageous bug where pieces stop falling midair. I think tetris effect is extremely important for us (although we might not like it). By targeting a more casual audience Tetris Effect appeals to a lot more people. Furthermore it is not as "Asian-Themed" like PPT so it will suit the western audience better. I think this will be the gateway game for a lot of new tetris players to come and due to the aesthetic gameplay will probably be shared more on social media than current tetris games. I am very sure that Tetris Effect is just a PS4 timed exclusive. It will get a PC release eventually (maybe 6 months later), especially because of HTC Vive and Oculus Rift. Not sure about XBoxOne and Nintendo Switch though. I think this will be the gateway game for a lot of new tetris players to come and due to the aesthetic gameplay will probably be shared more on social media than current tetris games. It surely is. With the trailer and "Tetris Expert plays Tetris Effect", there are already 2 videos on Youtube that got clicked over a million times.